Linda Bogart Jacobs offers a compassionate and knowledgeable approach to real estate that is centered on handling challenges in a non-reactive manner and offering new perspectives on any situation. She thrives on the opportunity to work with people and is driven to succeed, both for herself and her clients. With a master's degree in mental health counseling and hands-on experience as a therapist, Linda's approach is rooted in listening and support. "The skills I have gained as a therapist are invaluable in real estate as they allow me to offer my strong intuition and empathy for others," she explains. "Buying, selling and moving can be emotional, even traumatic; my counseling skills are invaluable during the stressful real estate journey." Prior to raising her children, Linda was a licensed real estate salesperson, and she also worked in the title business for 20 years, giving her 360-degree knowledge of the complicated buying and selling process. 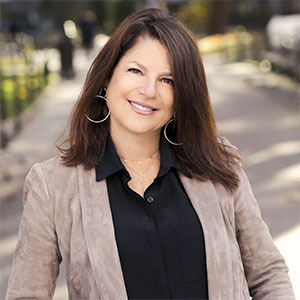 Born and raised in White Plains, Linda raised her family in Bedford, N.Y. and now resides in the West Village where she enjoys the beautiful architecture and outdoor spaces of NYC. In her free time, she enjoys live music, sporting events, art tours and frequenting the delicious restaurants of NYC.